I can hardly believe that I just graduated one child, and now only have two more left to send through the system. Our system, of course, seeing that we homeschool. This fall we will have a 4th grader and a 9th grader! It is mind boggling. Considering I have a crate full of books for each grade, K-12th, you would think that this school planning thing would get easier. If nothing else, it is more complicated now than it ever has been. For one, it seems that I have about one of everything available in my possession. Seriously. Add to that the fact that I review homeschool curriculum and new stuff is released every day, it gets rather confusing at times. 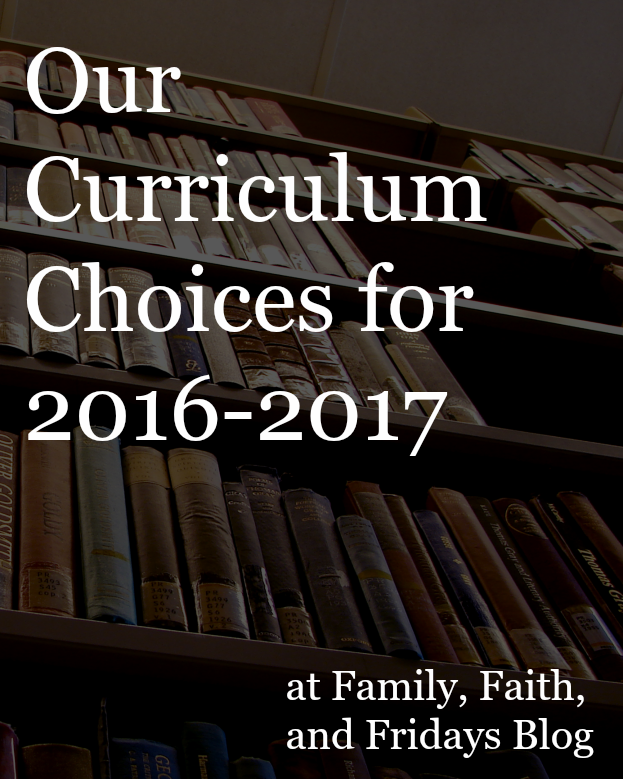 Oh, and there is that curriculum junkie syndrome, but that is a whole different post! So, that being said here is the current plan for 2016-2017! If they are highlighted, then they are linked to a review or post I have done in the past in case you are interested! I am sure I have missed something and I am sure something will change between now and September, but at least I feel like I have a handle on most of it. For the moment! Linking up with friends today! It is not very often these days that I get to read a book geared towards younger readers. After all, my baby just turned 9 last week. Yes, in a blink of an eye they grow up and those sweet rhyming books that steal your heart get replaced by chapter book that are not nearly as much fun in my opinion. That's why I jumped at the chance to get my hands on the new book, Would a Worm go on a Walk? by Hannah C. Hall, illustrated by Bill Bolton. Talk about cute! Would a Worm go on a Walk? is a sweet 32 page, hardback book that explores 9 different animals and asks if they would do a particular human activity, such as a worm going on a walk. It is asked if turtles, penguins, lions, and more would do something, and then it is explained why they would NOT do that thing. Through simple humor, kids hear that each living thing is created in a unique way by a God who loves them. and they act just like they should. and he calls them very good. In the end the author ends with "God's masterpiece is YOU!" I love this sweet book. I happen to think beautiful things happen to a child's mind when you read out loud to them. How much better when you can read to them about the love that God has for not only the creatures He created but also for THEM!? The rhyming phrases make it enjoyable to read and capture a child's attention. In addition, the illustrations are bright and cheerful, making this a beautiful book that you will cherish for years to come! I am excited to be able to add this to our growing collection for our someday grandchildren! And yes, even the 9 year old liked it! 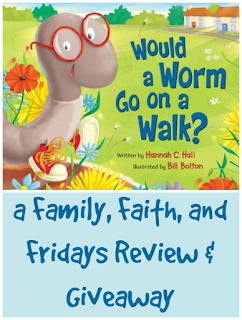 If you want to have the opportunity to in a copy of Would a Worm go on a Walk? just leave me a comment here on the blog and a random winner will be chosen next Friday! Labels: books, giveaway, review, Would a Worm Go On a Walk? 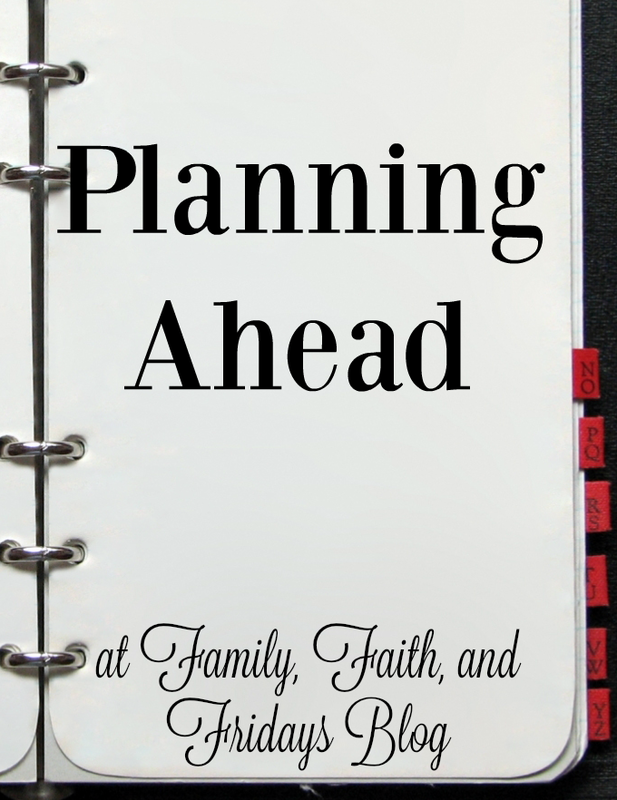 For homeschoolers it often seems that just as one year ends, you are already gearing up for the next year to begin. Ok, for most of us, we have been planning ahead for months, but we don't admit that in public. It is a disease, I tell you! After all, there are always new curriculums to choose from, but also things that we used that we would rather not do again. Just saying. Some things work well and some things do not. Some things are great fits for one child and not for another. Some things are just plain boring and need to be exchanged for something more fun. So how do you even get started with making decisions? Did my child learn? For those who keep track of grades, this is fairly easy to measure. If they are getting A's you are probably safe. If more C's are showing up, re-evaluate. If you are in the no-grade camp, ask yourself - does my child grasp these concepts? Can they explain or teach these concepts to another person? Are they confident with that specific subject matter? Did my child have fun? Yes, fun! One of the things I love about homeschooling my kids is seeing the smiles on their faces when they really are enjoying learning. For one child it may be retelling me their history lesson and for another it may be showing me their latest art project, but at the end of the day, my goal is to have seen a smile on their face and hear excitement in their voice. At least once! Did I enjoy teaching? Let's face it, our kids will learn more if we enjoy teaching them. We, as their teachers, set the tone for their day. If we are having fun they are more likely to have fun. And quite frankly, to get through the year, you better hope that I am having at least a little fun. Do I already own something similar? It is easy to fall into the trap of wanting brand new everything each year. And I am talking about more than new pencils and notebooks. Between the shiny catalogs and the vendors at the conventions, you can easily be convinced you need it ALL! Stop for a moment before you buy that shiny new toy and consider if you have something similar that will work as well. Sometimes the tried and true products that have served you well for years are just as good. Can I afford this? Some curriculums out there are expensive and worth every penny! But there are also a lot of free resources available if you just do some research. If money is an issue for you, prioritize your needs and then do your research. Homeschooling does not have to break the bank! Can someone else teach this better? I believe with all my heart that no one knows your child like you do and therefore no one is more qualified to teach your child than you. But, I also believe that some are more qualified to teach certain subjects. Each year we look at the subjects we feel need to be covered and then decide if any of those would be better off taught by someone else. For some that may be upper level math, for others, Chemistry. Don't be afraid to outsource subjects you are not comfortable teaching. With a little thought and planning you can set your child and yourself up for a successful school year! Back to the planning board for me- curriculum choices for the boys coming soon! I can hardly believe that I will only be teaching a 4th and 9th grader this September! Time is flying. What Do You DO All Summer? Have you figured it out yet? Summer is here! 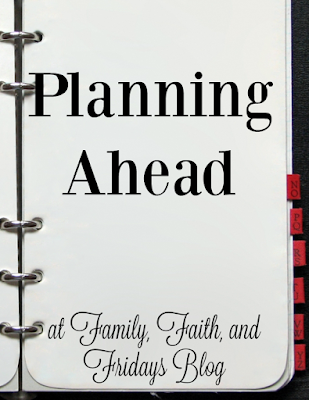 For many people, homeschoolers or not, that means kids with a lot of extra time on their hands. Time to whine or time to have fun. Time to get in trouble or time to be productive. Time to regress in learning or time to learn something new. Time to follow mom around or time to make new friends. What time are you going to choose for your kids? And I do mean YOU! Because, let's face it, if left to their own accord, most of our kids would naturally choose to sit on the couch and veg or follow us around complaining they are bored. So how can you beat the system? Give them options ahead of time. Now is the time to be proactive. Sit down and make a list (a L-O-N-G list) about the choices they have. Once you have a list made, make it visually pleasing. The more excited you are, the more excited they will be. Yes, that bottom suggestion says "Kiss Ashton." She is sneaky! Then sit down as a family and discuss the list of options. Remember, this is not a punishment. It is a list of ideas to get them thinking. Often times, those sweet kids of ours just go into zombie mode and forget to think. They may just need a fresh idea or a little push in the right direction. No, they are not limited to the list. But in our family, you can come up with your own idea, find something on the list that interests you, or ask mom and dad what job they have for you since you cannot find anything else to do that interests you. As you can imagine, if you keep up with things here or on our Family, Faith and Fridays Facebook page, this week has been a little crazy! So our random 5 is a random 3 this week because, well, I am exhausted! 1- Our raspberry bushes have exploded so now not only does Colby pick in the mornings, and sometimes in the evenings, but we also have various friends picking too! Come on over! 2- This kiddo celebrated his 9th birthday on Saturday! 3- I am tired! Did I mention that already? We have dear friends visiting this weekend and I cannot wait to just settle in and relax with them! There's just something about friends that puts things into perspective! How blessed we are! College Visit and 4 day drive! Riley wants to major in Musical Theatre. Riley wants a BFA in said degree. Riley wants to go to a Christian college. All that equals Riley going to Mississippi for college. That means she will be 13 hours away. 13 Ya'll. I know this because I (read: my hero husband) just drove it in four days. While Riley and Colby entertained each other and had bonding time! Yes, we left on Sunday, spent the night on the road and drove the last few hours in on Monday. Monday afternoon she met friends, attended meetings, had fun and spent the night. Tuesday she had a full morning of events and we were back on the road by 1, driving until 10 that evening. Wednesday we drove the rest of the way home and collapsed- hence no blog post on Wednesday. Whether you are the driver or not, that is a long four days! While Riley and her dad had visited the school before, this was my first visit. Yes, it is hot there, but the lovely campus and amazing staff made up for that. Or at least allowed me to ignore it for the most part. We even found a quaint little taco restaurant in the downtown area and ate outside with a breeze and music in the background. If you ever visit Jackson, you should try the shrimp nachos at Jaco's Tacos! They are amazing and enough to share! In between being drug across states and around the campus, Colby got some swimming in, lots of car bonding time with his sister, and finally collapsed for a few hours on the way home. Riley got registered for classes, made some great friends, met her new roommate whom we adore, and is ready to tackle the fall semester. MaxScholar Reading Program- Schoolhouse Crew Review and fun! MaxScholar is a comprehensive reading program geared to teach valuable reading skills as well as reading comprehension. This adaptive program is good for beginning readers as well as those struggling to read or those that need just a little more practice or encouragement. A good mixture of skill teaching and games encourages kids to practice and excel. MaxScholar can be used on your computer at home or various mobile devices making it easily portable for parents and kids on the go! See, school in a hotel! MaxPhonics- This part uses a multi-sensory approach to teach phonics. It is geared for ages 5-7, but again, is also good for anyone who needs help with basic reading and phonic skills. Here you can work on letter sounds as well as blends and even work on your handwriting. Videos demonstrate correct pronunciation, perfect for auditory learners. Fun games are included to help reinforce what your child is learning. MaxReading- This section concentrates on, you guessed it, reading! It contains 13 levels to work in, Questions after each chapter test on comprehension. Your child can use a highlighter to mark passages and will learn to summarize and outline. Placement tests will help put your child where they need to be, but you can ask the company to adjust that placement if you feel the need to. MaxWords- Here your child can practice their vocabulary skills. Latin and Greek roots are taught, as well as prefixes, suffixes and spelling rules. 16,000 words are taught in all! MaxMusic- By using piano and guitar skills and well known songs, kids can practice their reading while playing a tune and filling in lyrics to songs, all while improving their memory skills. MaxVocab- Think of this area as an overgrown dictionary. It teaches thousands of vocabulary words by interactive games like hangman. MaxPlaces- Children can learn about 51 places in the world with just a click of the mouse. Once you choose a location, you read about that place and then test your reading skills by answering a series of questions. MaxBios- This area teaches about people from the past and the present in a timeline format, while kids practice their reading and organizing skills. Because there is just so much content and it would take forever to tell you about it all, I want to concentrate on the two areas that Colby, age 8, enjoyed the most- MaxMusic and MaxVocab. The MaxMusic part does not surprise me. Like his older siblings. this boy loves music. While he has not learned to play the piano yet, he hears it a lot with his two older sisters still in the house. He doesn't get a lot of keyboard time, so Colby was thrilled to be able to play on MaxMusic. He was even more excited when he found the guitar games! His favorite part was the game in which you hear a few notes played and then you repeat it on the keyboard. You continue to do so measure by measure until the song is complete and then it plays the song in whole back to you. What a great way for him to practice not only his memorization but patience a well. Another part of this area in which you choose a song and artist and then do several different activities with that song, includes filling in missing words (while practicing what various parts of speech are) and clicking on certain parts of speech in the entire song. Kind of a grammar lesson but in a fun format. The activity that did surprise me that Colby enjoyed was MaxVocab. While he dd not want to engage in the dictionary part of the lesson, he loves playing the hangman game that gave you a clue of a word and then you guess the word they were looking for. Sounds pretty basic, but it stumped me quite a few times. Even though Colby got frustrated with this several times, he went back to it first thing when he logged in. Go figure, the boys likes solving problems. I liked that it made him think and helped with his spelling skills as well. Since Colby is a strong reader, the reading specific portions of MaxScholar did not pull him as easily, but with our summer school schedule starting soon, I intend on having him access at least one additional section each day before he is allowed to play with MaxMusic or MaxVocb. Hey, a mom has to do what mom has to do, right! If you have a child that is just beginning to learn to read or needs a little help in doing so, I believe that MaxScholar is a great program to get you started on a positive note. It's multi-sensory approach to reading will capture all learning styles and help your child succeed! 5 on Friday- Summer Crazy! I do like summers, mostly, so I am not complaining, mostly, but boy has our crazy life just gotten crazier. Why does summer just do that? 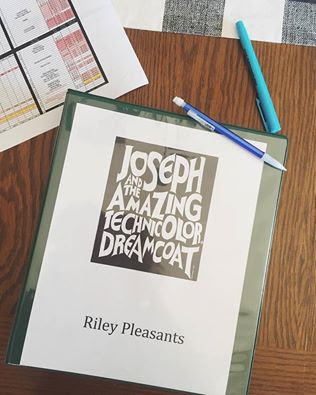 1- Riley began practice for the local community theatre's production of Joseph and the Amazing Technicolor dreamcoat. She has practice Monday through Friday through mid July and then ends with 5 performances. Crazy! 2- Colby began playing baseball for the local parks and rec here in town. I thought, two practices a week, I can do that. Never mind that I did not realize there are also two games a week. In case you missed that- 2 + 2 = 4. FOUR nights a week. Crazy! Every baseball guy needs someone to help put their socks on right? 3- Ashton is knee deep in working part time and building her sewing business full time. She just finished up four quilts and has now several other orders waiting for her. She picked up this adorable sewing machine so she could add another one for use when she teaches. (Did I mention that she also teaches 5 students sewing as well?) Crazy! 4- Salem has one week left of 8th grade! Yes, he will be a FRESHMAN in high school soon and also keeps busy with a part time job at the ball field here in town. Did you miss that I am getting ready to teach high school for the THIRD time!? Crazy! 5- Because I just needed another thing on my plate (hear the sarcasm? ), I planted a garden the past few days. Lettuce, carrots, onions, peas, beans, cucumber, tomatoes and watermelon. If the bunnies will stay out of my garden we might actually grow something. The back half of the bed you see is all raspberry bushes that are actually producing. They were taking over the front bed, so Clarke and I cut them way back and I have threatened to take them out all together after this season, but for now they are a daily source of joy for Colby! He loves going out each morning and picking raspberries for breakfast. Unfortunately they are so thickly planted, there a probably hundreds of berries we just cannot even reach to enjoy. Crazy! I actually have A LOT more crazy I could add to the list, but I will stop for now! How about you? What are you doing crazy this summer? We have been busy around the house now that the weather has warmed up and we can finally be outside. Well, in between rain storms! One of the places I have been working on is the back patio area that is underneath our deck. The deck is nothing to brag about at the moment because our sweet neighbor has warned us that our south facing deck will be impossible to step foot on in the next month due to the heat. No thanks! So instead, I am focusing my efforts on a shady spot, hoping I can at least enjoy the fresh air a little each day. Yes, I did finally sweep all the mulch off the rug, I promise. I used the rug we had at our previous house because I still love the colors and added some furniture and new pillows. You may recognize the furniture, because it is identical to what I have in the front, minus the blue chairs (which we already had). I know from experience to not go with different stuff, just in case we move and end up needing to use it all in one place rather than two separate areas. Just call me an expert military wife-mover, or just someone who has learned the hard way and gotten THAT look from her husband. Just saying! While my in-laws were here we kept them busy on some projects and one of those included adding bricks to the small bed at the edge of the patio to help keep the mulch from washing out, like it has done in the above picture. Now, if we could just figure out how to keep the dog from trying to make her resting place IN the bed! Before I swept up the mulch I spread. Speaking of beds, that is another project we worked on with my in-laws. They are masters at landscaping ideas (wish you could see their amazing yard) so we picked their brains for ideas while they were here. Although we had some good things started already, there was some crowding due to growth of bushes and way too much going on in a few places. After on the other side! So we transplanted 5 bushes, added two, and took out four rose bushes that were just an unsightly mess. We also divided and replanted some ground cover to better locations to unify the look. Then we spent 4 hours spreading new mulch in all the beds. The end result was worth the blisters, sunburns, and sore backs the next day! This whole thing, as well as the projects still left to do, remind me that while owning a house is lovely, it takes work, upkeep, and money to keep a place up to par.